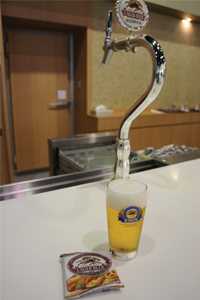 We recently joined a brewery tour of the facilities at Kirin Yokohama Beer Village and got to learn about everything from brewing the beer to its packaging from one of their guides. Tours accommodate all ages and move as a group. Just as you step inside the factory, a distinct fragrance wafts over you and your anticipation for the tour rises. At the start there is a big screen that explains what Kirin demands from a beer, after which the guide leads you deeper into the factory to the ingredients corner. There, try smelling the aromas from the malt and hops. When the yellowish green hops, which almost look like pine cones, are broken apart, there appears a yellow powder called lupulin. This is what imparts bitterness to the beer. The water, meanwhile, comes fresh from Sagami Lake's ample reserves. From there, we moved to the brewery. The huge kettles are visible beyond the glass and total nine in all. They first boil the malt to create wort. On brew days, you can even try the syrupy wort. Although this wort doesn't yet contain alcohol, its sweetness combined with the bitterness and aroma from the hop is apparent. Next, they add the yeast and begin fermentation. You can't actually see inside the 20-meter tall fermentation tanks, but check out the video screen which demonstrates how the alcohol and CO2 are produced from this process. After all this comes the conditioning tanks and filtration to produce the beer that we always drink! At the bottling, canning and keg line that follows, you'll be dazzled by the speed. The special fillers race to top off and seal 2000 cans in a mere minute. During this entire tour, there are always panels and videos, as well as the guide, to explain it all in easy-to-understand detail. There is also a corner that describes Kirin's commitment to the environment. The Yokohama factory makes use of installed solar panels and gas engines, thus producing all of its own energy. In the factory's research department, they don't just study how to make beer delicious, but also test ways to reduce the impact of the packaging. By reducing the size of the canning lid, they reduce their aluminum usage by 26,000 tons per year, while a single bottle can be reused for as long as 8 years (because it is nearly 100% recyclable). 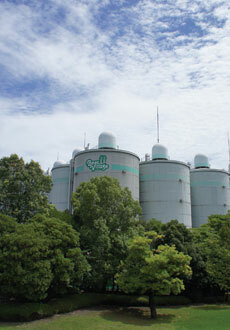 The byproducts of brewing are reused for things like fertilizer, composting agents and ingredients for health foods. On the recently launched "Tour to Appreciate the Abundance of Nature," participants can experience a biotope on the premises in addition to the tour. There are plants for all seasons there, and all kinds of life in the pond. Finally, after the tour has come to its conclusion, you get to try freshly made beer! After guides further demonstrate a three-part pouring technique to enhance flavor (try it at home, too), it's time to drink up. Tours are free, but do require reservations. There are English tours as well, so call if interested.